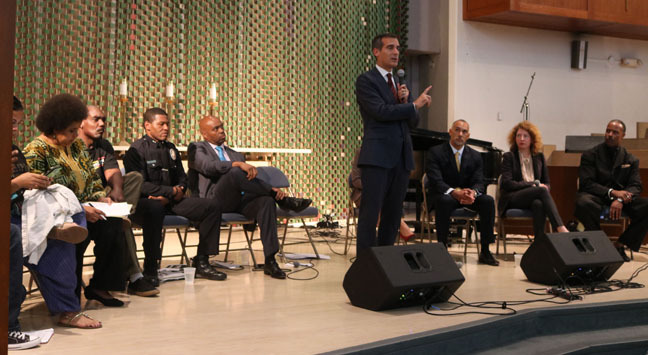 On Monday, October 19, Los Angeles Mayor Eric Garcetti hosted his first town hall meeting in South LA on Monday night to address employment, street services and community safety with hundreds of local residents, elected officials, city agencies and business owners at Holman United Methodist Church. While the agenda was intended to cover a broad scope of topics impacting South LA residents, the night quickly turned into a Black Lives Matter movement takeover. A panel of experts also joined the stage, but remained remiss of an opportunity to address the community after high tensions rose between Blacks Lives Matter protestors and Mayor Garcetti. The evening’s panelists included Abigail Marquez, Director of Workforce Development/Econ­omic Opportunity, Mayor's Office; Heather Repenning, Board of Public Works Commissioner, Matt Johnson, President of the Los Angeles Police Commission and Bill Scott, LAPD South Bureau Chief Deputy, amongst others. While Mayor Garcetti gained seldom support when offering details on his most recent achievements as Mayor, others cried foul declaring the town hall meeting as a ploy for re-election. Each time Garcetti approached the microphone and began to speak, members of the Black Lives Matter movement turned their backs on the Mayor as a definitive symbol of civil disobedience, power and unity against what is believed to be neglect on Garcetti’s part. Before the focus shifted, one community member asked Mayor Garcetti if the Crenshaw/LAX Transit Corridor project was designed to increase sales taxes while derailing black businesses in the South L.A. region. Garcetti responded by saying that his office has been proactive in helping small businesses “plan their expansion and get a business plan.” “We’re not just waiting for people to come to us. We walked up and down Crenshaw and we’ve also put the word of to those who have come in,” he stated. Dr. Melina Abdullah, Black Lives Matter organizer and professor of Pan African Studies at California State University, gave Mayor Garcetti and LA Police Commissioner Matt Johnson a quite impassioned and unfiltered piece of her mind, citing Garcetti and Johnson’s disrespect for the black community. She said that when selecting a police commissioner, Aqeela Sherrills was completely overlooked as a viable candidate. Sherrills is a man widely known for successfully organizing peace treaties amongst gangs in Los Angeles and someone Abdullah referred to as a “global expert on public safety”. “We’re here because this is real for us. This is not a political game. This is not about your re-election. This is about our lives,” Abdullah stated in solidarity while on stage. Several community activists also made it clear that “there is no such thing as black on black crime.” Two community members wanted the Mayor to address what strategic partnerships currently exist to address the structural and root causes of poverty driven, violent crimes in Black communities. The activists went on to say that the term “black on black crime” racializes crime and criminalizes black people, as opposed to acknowledging crime as an American problem. In response, Mayor Garcetti said, “You’re right, your analysis. I hate this back-and-forth we hear nationally, where people say black lives matter and politicians say all lives matter. Black lives matter in a unique way,” he stated. Garcetti then outlined several solutions to the issue, stating that creating pathways to break the cycle of violence in Black communities must be coupled with job opportunity, a continued push for higher wages, housing affordability despite the plan to create 100,000 housing units in 8 years, and utilizing the Domestic Abuse Response Teams (DART) as a tool to disrupt the cycle of violence occurring in family households. Amidst the thunderous chants of “Black lives, they matter here,” Rev. Kelvin Sauls attempted to gain control of the meeting, but was unable to calm the outcries for change and reform in the black community. The town hall was scheduled to close with an hour long resource fair, but ended abruptly after Black Lives Matter members rushed the church stage and surrounded Mayor Garcetti, following him outside to his car.